The foam pad on my Sport seat is quite tiny, nowhere near as wide as the seat area itself. It's around 1" thick so I find it quite uncomfortable as the two sides are a distinct edge. So, question is: is it an original and why so small ?, or, is there an improved version ? If not a special shape for a reason, I think a home made 'comfy ' pad is required before she comes out next year ! 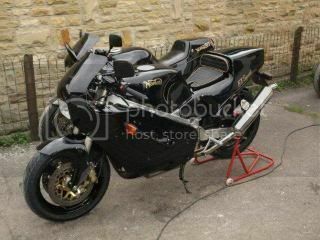 Garry (of Garry & Amy fame)made a "duel seat" for his F1,perhaps you could contact him for some tips,J.B. The pad is that size 'cos it's a close replica of those fitted to the JPS race bikes of the time. Other comments about it were along the lines of "Make it uncomfortable so the rider goes faster to get to the end of the race first". Seemed to work anyway! For one of the Rugeley twin-seat bikes, I moulded a grp seat base to the curvature of the actual seat and had it upholstered with thicker foam and a leather cover by Barrs of Hull. The self-adhesive foams, available on Fleabay, don't like sticking to a curved surface so get the plain foam and use a contact adhesive. Thanks Richard, I did wonder why it was that that small size and shape. I suppose a short circuit racer is on "one cheek" most of the time ! I'll carefully remove the race look-alike and re-do with something more comfortable. JB- is a "duel" seat for a couple who hate each other ? Hi Wayn,If your bike is the one nearest the camera,looks are deceiving,seems far to thin ,mind you ,If memory serves you are well "upholstered" J.B.
its more way more comfy than my ble sports std seat or my f1. its a properly made upholsterer seat and back pad with gold piping, i dont know who made it the bike came with it.